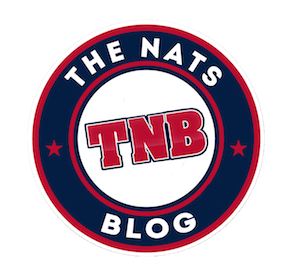 The Nationals are on a mean streak, and that doesn’t even refer to their 7-1 roadtrip. All it took was Bryce Harper’s retaliation to Hunter Strickland being a giant baby for the Nationals to revv up their fire. Koda Glover must be worshipping at the church of Bumgarner because he was all up in his feelings when he confronted Yasiel Puig for looking at him. Glover told Puig to “get back in the dugout,” for looking at him. I don’t know what it’s like to look into Yasiel’s eyes, but it must be something special if it’s got pitchers reacting like that. 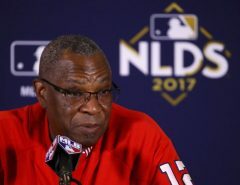 Ray Knight roasted Glover for the incident postgame, and Koda says he doesn’t hold anything against Puig, which is all that matters here. Though, Harper may take exception to any threat to his VP of Making Baseball Fun Again. Side note: comparing anything Puig did to pitchers throwing 100 MPH baseballs at him for celebrating is the most dumb take here, and I highly advise against it. 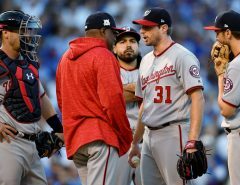 However, Max Scherzer, the Nationals’ raison d’etre, provided insurance against any bad taste the left by the Glover/Puig debacle innings earlier in the seventh with more psycho yet somehow more appropriate aggression. 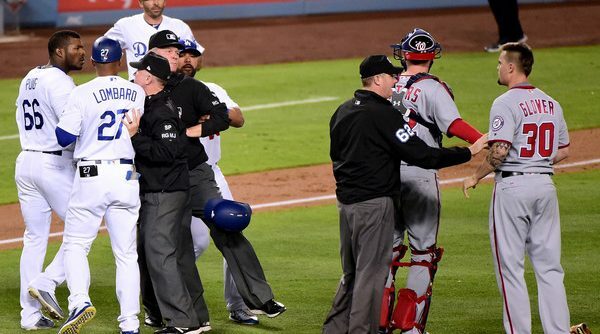 Scherzer faced Chase Utley, who would be his final batter, came set, and unleashed a string of cursewords that outdoes most of his typical muttering. It was extremely good, extremely funny, and I am extremely here for it. I watched the Orioles until I was ten when I realized that (most) fans at RFK didn’t shout letters during the National Anthem. I’m a Public Relations and Economics major at VCU, the associate managing editor at TNB, and a sports columnist for a student newspaper. Be my friend on Twitter dot com: @maddc8.